Baillie Gifford & Co., the second-biggest shareholder of Tesla stock, has taken an interest in Nio, the Chinese electric vehicle automaker that recently became a publicly traded company. Baillie Gifford now owns an 11.44 percent stake in Nio, according to a regulatory filing posted Tuesday. The company disclosed that it had purchased 85.3 million shares, which were valued at about $515 million as of the close of trading Monday. 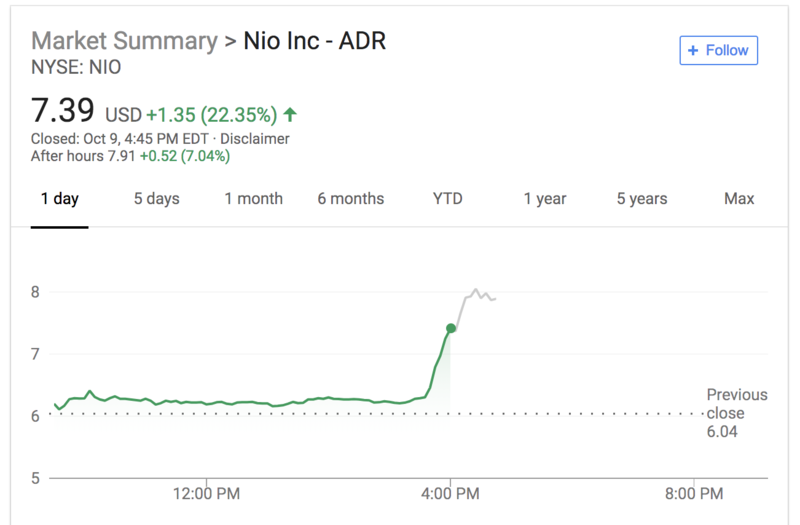 The filing pushed shares of Nio to close at $7.39, up from its opening of $6.19 this morning. Shares are up another 7 percent in after-hours trading and are continuing to climb. Nio raised $1 billion when it debuted on the New York Stock Exchange last month. Nio wants to become the Tesla of China — and beyond. The company has operations in the U.S., U.K. and Germany, although it only sells its ES8 vehicle in China. The 7-seater ES8 SUV is priced at 448,000 RMB, or around $65,000. That’s cheaper than Tesla’s vehicles, especially since new, higher import tariffs have driven up the price of its Model X SUV and Model S sedan. Those tariffs, plus other costs like shipping Tesla vehicles overseas, is pushing the U.S. automaker to accelerate its China factory plans.